Everybody knows that breakfast is the most important meal of the day. But did you know that some morning choices can set your mood for the rest of the day. Eating a healthy breakfast every morning can reduce the risk for diseases such as cancer and diabetes. 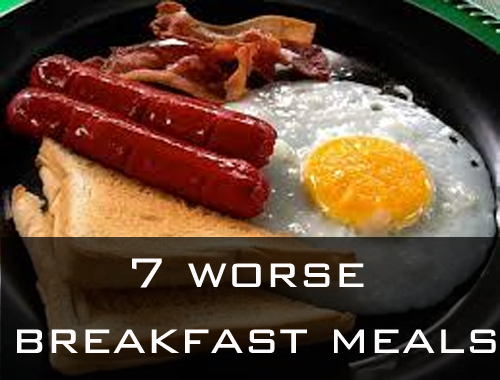 We have a list of the 7 worse ideas for breakfast meals. We’ll be following up in the next post with 7 of the best breakfast meals! Processed meat has nitrates that are associated with colorectal cancer. In fact, the Institute for Cancer Research published a list of the top ten things you can do to reduce your risk of cancer. Avoiding nitrates is a number one of them. What does that mean for morning meat eaters? It is time to find a different breakfast option. How can you tell the difference between a bad sugary cereal and a good one for your health? Some cereals are full of carbs and sugar. When you eat them, your blood sugar rapidly spikes and then bottoms out. Since you probably do not want your energy to crash at the beginning of the day, it is best to avoid those cereals. Instead, choose cereals with higher fiber and protein. While natural maple syrup is a healthy sweetener, there are many artificial types of syrup on the market that are full of high fructose corn syrup. The sweetener, which is derived from corn, is also present in most processed and packaged foods. High fructose corn syrup can lead to more abdominal obesity and visceral fat(Hard fat), which is stored between the organs. This is the fat that leads to cancer. A recent study in one journal also linked high fructose corn syrup consumption to diabetes. Not only are these pastries made with refined white flour, but there is much sugar added. Sugar is the worst way to fuel you in the morning, because it results in a rapid rise in blood sugar. That means you will be hungry sooner and increase your chances of high blood sugar, obesity and diabetes. If all those health risks are not enough to put you off pastries, there is the other way they can be detrimental to your health. As many scientists believe sugar and cancer are linked. Who doesn’t love a good roti prata in the morning?Just thinking about its crisp exterior to its soft, buttery interior makes me feel hungry already. Unfortunately, it really does nothing for your figure. A single roti prata with a bowl of curry packs close to 500 calories with a whopping 895mg of sodium. As a healthy adult woman, your daily sodium intake caps at about 2300mg. By having a breakfast that’s high in sodium, you have already gone through close to 40% of your daily intake. Long- term effects of excessive sodium could lead to edema, a condition where the body retains fluids, as well as high blood pressure. You’ve got your noodles for carbs, luncheon meat for protein and eggs which are good for your metabolism. Seems like a pretty balanced diet? We hate to break it to you but it really is the exact opposite. The culprit here is the luncheon meat. Like other processed meats, it’s loaded with salt and preservatives. In total, this dish has almost 1000 calories (yikes!). It’s bound to completely throw you off your recommended 2000 calorie intake for the day.